Best popsicle maker. Ever. Restless in Riffa: Best popsicle maker. Ever. Hot weather is synonymous with ice-cream. But as I'm sure you noticed, my quest for healthy options never ceases. So homemade popsicles are the perfect treat. A few years ago, my daughter got the coolest birthday gift. It was a gift she loved and I loved even more. It's called the Zoku and basically, it makes popsicles instantly. Unlike the conventional molds that you pour the liquid in and wait till it freezes, this one is instant. Of course, there's a catch. But it's a bearable catch. 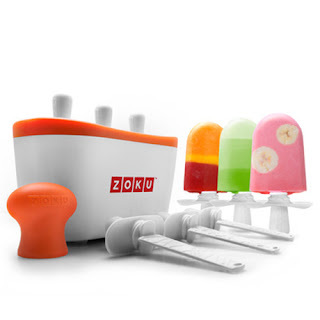 Basically, you have to freeze the Zoku in advance and when needed, get it out and use it to make popsicles. So basically, once cleaned, freeze it for at least 8 hours and then it's good to go. I always have mine in the freezer so I can use it whenever necessary. The model I have is the 'triple quick pop maker'. Find out more about it here. You pour whatever your heart desires in the molds, and within 7 to 9 minutes it's set! You can reuse it 3 times until it can't freeze anymore - so that's a total of 9 popsicles. Not bad huh? The downside to it is that there are limitations to what kind of liquid you can pour in - for instance, no sugar-free drinks. Also, sometimes, you need a really strong hand to get the popsicles out so make sure you are prepared for that. For the readers in Bahrain and the Gulf Area, I know Virgin carries them. Everyone else, you can also find out more about Zoku online. Go get one - you won't regret it.